Ooops, sorry to hear about your accident, it has happened to us too — that's why we’ve noted to be careful when removing from the freezer in the instructions (plastic tends to become brittle at low temp) — give it a few minutes to warm up. ★ Cheapest, fastest way to get a new plastic carrying case would be to order online. Here is a link to Amazon where you can order a replacement (this is the new plastic storage and carrying case we are using since Sterilite has discontinued making the previous one). Q: How can I order a new plastic carrying case (mine broke)? Simply place the housing on a flat surface such as a sturdy table or kitchen counter (without the PsP in it) and, placing the heels of both hands on its top surface, lean somewhat forcefully down on it. In this way you'll exert enough pressure to slightly bend the top surface and spread the legs a bit, thus relaxing its grip. Do this adjustment in increments until you get the grip just the way you want it --- if it becomes too loose, just press the legs towards one another (without the PsP in it) and you can make it tighter again. Q: Even when pressing down on the housing as instructed, it’s hard to slide the PsP in and out. Can it be made easier? 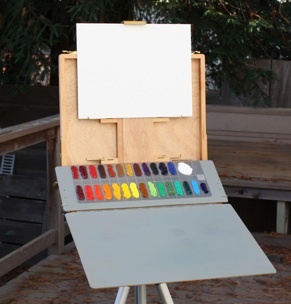 How can I use the Paint-Saver Palette (I don’t see my setup in the listing of Easel Kits)? Send us a photo of your setup and/or more details. We’ll be happy to recommend a solution we can make for you, or one you can make for yourself. Q: My PsP’s grip is too tight, and is hard to slide off my clip-board. You can loosen your PsP’s grip on your clip-board by sliding your PsP onto a slightly thicker board—this will stretch the the clipping portion slightly so it no longer grips so tightly. (Don’t overdo this stretch, since once the grip is loosened it is difficult to get it tighter again). I have a question I don’t see answered here. What shall I do?!!! Q: My PsP grip it too loose, and slides off my clip-board too easily. If you’ve loosened your PsP’s grip on your clip-board too much, you can make the grip tighter again by placing several layers of tape or gluing a thin piece cardboard on the back of your clip-board (where the clipping portion grips the board). Thus, by making your clip-board (or palette) a little thicker you can strengthen the grip your PsP has on it. Q: How often can you freeze your colors? Storing unused colors under water, while a known practice in the past, is now recognized as not the preferred method of keeping them from drying, especially over a long period of time, since the bonding capabilities of oil colors can be compromised (http://painting.about.com/od/oilpaintingfaq/f/freezing-oils.htm). However, in a pinch for short-term storage (e.g., overnight) you can place the PsP itself (not the housing) in just enough water to cover your colors (the plastic carrying case may serve well in this regard). When you’re ready to paint, simply incline the PsP so excess water runs off—and place in the sun (or in front of a fan, if indoors) to allow the remaining moisture to evaporate naturally. Another method is to put a few drops of clove oil on one of those little, round, self-adhesive felt pads (that you put on drawers to make them close quietly) and put that in your plastic case with your PsP. The clove oil’s presence in the sealed container acts as an anti-oxidant and keeps your oils from drying. Q: If a freezer or fridge is not available, can I keep my colors from drying by storing them under water? Q: Even though I’ve first put a particularly oily color on a paper towel to absorb the extra oil, it is not unusual for the color to slide on the paint-saver from the top row into the second row below, especially if placed at an angle. (I do paint much of the year plein air in a hot climate, with temperatures ranging from 75 to 85 degrees on average.) What should I do? The problem may be with the oiliness of the particular brand you are using, but here's a possible solution. Take all your colors off the PsP, then paint each of the areas on your PsP where your colors are located with a thin layer of the corresponding color. If you then set the PsP aside to dry, you will have established a more secure, non-slick base which will anchor the fresh color that you put on top, and keep it from sliding. Once again, its always best to use the PsP at a only a slight angle at first, until the colors have established a foothold after repeated use. (See instructions for more details). Still have questions after reading the instructions? Q: What if I don’t have access to a freezer? Put your PsP in the fridge. This probably won’t work as well as the freezer (oil colors stay workable for months there), but any lowering of temperature will retard your colors’ drying time somewhat. Q: Are there any odor/health/cancer issues when putting oil colors in the freezer? You won’t get much odor from cold oil colors — if you want to be sure just put everything in a plastic bag. The carcinogenic parts of your colors are some of the pigments used, e.g., cadmiums, cobalt, etc., not their linseed oil vehicle, which is what you can smell as they are drying.